Hello Stampers! Today's card was inspired by a Hero Arts Card I found on YouTube. Click here to check out the video. The colors I used for the background are Pink Pirouette, Melon Mambo, and Rose Red. I pulled in the Rose Red at the last minute for darker coloring at the bottom. I did let the paper dry for a couple of hours before completing the card. Using the Pop of Paradise stamp set, I used the smaller leaf image. 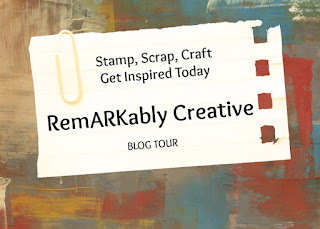 I used Versamark ink to ink the image and added gold embossing powder. Using the larger leaf image, I stamped it using Emerald Envy ink and fussy cut it out. 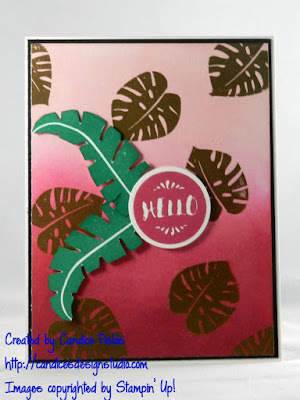 The sentiment was stamped with Melon Mambo ink and punched using 1-3/8 circle punch. I just love how this card turned out! Thanks for stopping by!